Dear GOP: I move that, if you are going to defund Planned Parenthood because they provide abortions, you should also act to be sure that God Fearing Anti-Choice Anti-Woman Pro-Life Americans do not provide any money to any business or institution that offers good or services which could be used to induce abortion. 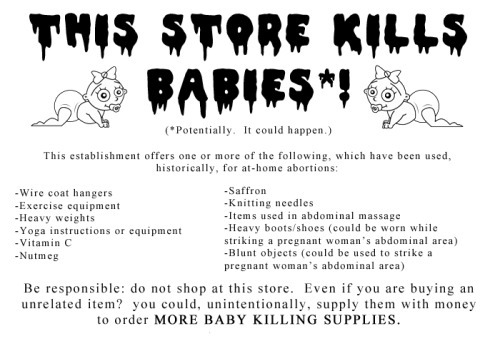 I’ve taken the liberty of designing a sign that these businesses could display, prominently, for shoppers. YOU’RE WELCOME! Sad thing is, when I first saw the image I was sure it was something someone had actually put in front of a store. Such a thing still would not shock me.